Hassle-free birthday parties packed with science and fun! In addition to participating in an exciting Mad Science presentation, every child at your Mad Science party will make a fun, hands-on item to take home. Slippery Slime: Discover the ooey gooey joy of polymers and make your own slippery slime. Techblenders: Create a motorized device that spins an optical illusion and a Newton colour wheel. Catapults: You won't be able to knock down any castles walls, but it's still great fun to experiment with tension. UV Detectors (AKA Sunbeads): Detect solar radiation while accessorizing stylishly. Spynoculars: Bend some light waves as you create these Mad Science binoculars. Circuit Mazes: How steady are your nevers? Kids can improve their dexterity while learning about electrical conductivity. Other: Talk to your Mad Scientist about new or seasonal options. The Mad Scientist brings everything that is needed for the party and takes any mess away when they leave. All we need is a space where the kids can get comfortable and everyone can see (ideally in an area where the lights can be dimmed), a table to set up our equipment, and access to electricity and water. All of our parties are designed for up to 15 kids (we do have formats for larger groups); for each additional guest a $2 charge will apply ($4 for the Mega party). Please note that a $50 deposit is required to secure the party time. If you need to cancel, this deposit is refundable up to 2 weeks before the party date. This party was specially designed with the youngest crowd in mind! It focuses on our Bubbling Potions which are great to watch for those kids that are still a little shy around strangers, and great to do for those kids that aren't. Take home experiments are limited to Rainbow glasses and Thermocolour cups so that you aren't sending home anything with small pieces or that could make a mess. We also offer model magic animal paw prints to groups with less than 15 guests. The basic no frills package for those who have other activities planned or want to keep the price down. Our most popular package includes our Bubbling Potions series of experiments in additional to the usual Birthday experiments. Kids will thrill to Carbon Dioxide bubbles, taste the Burp gas and have bubbles on their hands, bubbles on their heads – bubbles everywhere! BEST BUY – 10% discount on Goody Bags for your Standard Party! 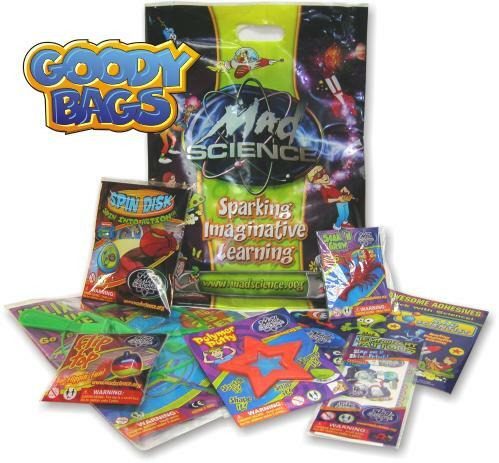 GOODY BAGS - Enhance your birthday party with our Mad Science themed, premium quality Goody Bags! Save yourself time and money by offering ready- made Goody Bags that spark imaginative learning and endless hours of fun! Only $5.00 + tax per bag. Helix Flyer: Allows children to take science for a spin. Flip Top: Flipping fun that explores the idea of objects having a center of gravity. Polymer Putty: Stretch it! Shape it! Snap it! Stamp it! All while learning about polymer chemistry. Awesome Adhesives: Be inspired to "stick with science" with these cool Mad Science stickers! Temporary Tattoos: Slap on a skin-print with these full color temporary space tattoos. Spin Disc: Spin into action with a spin disk and handy wrist launch.